Fluorescence Image Microscopy | Pearson Coal Petrography - We fingerprint your coals, coke and carbons. 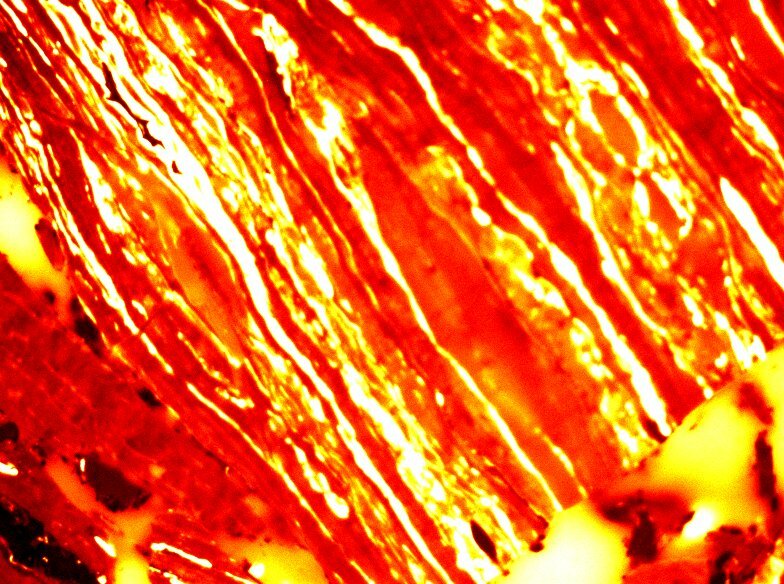 Our introduction to Fluorescence microscopy came from an interest in coals that had higher than normal Gieseler Fluidities. A few years ago, we had purchased a Preiser Gieseler Plastometer that had the capability to measure Gieseler fluidities as high as 180,000ddpm, until that time most previous generation Plastometers only measured as high as 30,000ddpm. Within days of receiving this new instrument we started testing coals that were regularly between 30,000-140,000ddpm. The variation was amazing, yet with normal petrography of the same coals, the differences could not be distinguished. The Romax of the coals remained the same, as did the proportion of liptinites, vitrinites and inertinites. We developed a Fluorescence Microscope to measure the differences in fluorescence intensities. Sadly, although the method seemed to work quite well the commercial market for such a device was non-existent, and as such the system was retired, parts were used to build a Coke imaging system, which has advanced our imaging capabilities. 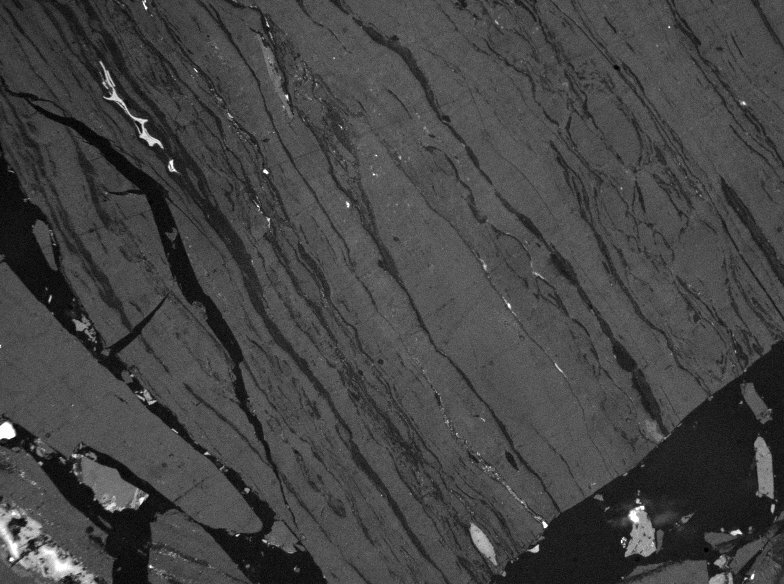 The current system uses a better quality camera than the initial setup, and improved microscope control enables us to make giant mosaics of entire coal samples, comprised of thousands of image locations. Characterizing the coal with millions of calibrated reflectance and fluorescence measurements simultaneously. Typical analyses are run with only 200 image locations, which take approximately 40 minutes to complete. Full coal mosaics take approximately 5 hours to complete. System was designed with the intent to have a robotic system, changing the light source and the emission filters on many locations of a sample without human interaction. After calibration, the computer controls each set of filter wheels, as well as exposure times, light apertures, sample focus, and sample locations. The software controls the number of locations to be imaged, as well as the number of images to take at each location (maximum of 4 in this version). The base microscope is an older model Zeiss Universal, chosen for the ease in modifying the system for an in-house built autofocus system. A Marzhauser scanning stage is computer controlled with a stepper motor controller system. So all axes x, y, and z are moved in between imaging the sample. The 200W Metal Halide lamp has spectral response very similar to that of typical mecury (HBO) style lamp-house. With improved intensity peaks and larger bandwidth for improved excitation in Fluorescence imaging. Mercury lamps have peaks at 365 -nm, 404 -nm, 435 -nm, 546 -nm, 578 -nm; the Metal Halide lamp has peaks with a wider bandwidth at 360 -nm, 398 -nm, 428 -nm, 540, 570 -nm . The Lumen Pro has a built in filter wheel that is computer controlled, this filter wheel can hold up to 6 different filter sets. Currently we are only using 3 locations for excitation, white light, green and blue frequencies. A green light excitation (542 -nm (+/- 20 -nm)) with an emission filter at 650 -nm (+/-40 -nm), similar to work by Claus Diessel (1985), and Jefferey Quick (1988, 1992, 1994). The exposure time for these images was set at 400ms, based wholly on trial and error, to get images that demonstrated good levels of contrast, without over saturation of the CCD. Blue light excitation at 475/35nm with an emission filter at 530/43nm, were chosen based on other published works, Han (1993), McHugh(1991), Rathbone (1993). Exposure for Blue light images were set at 400ms, wholly based on resulting image quality and contrast, again without over saturation of the CCD. The CCD is the final piece of the puzzle, it is a 12-bit cooled monochrome CCD. 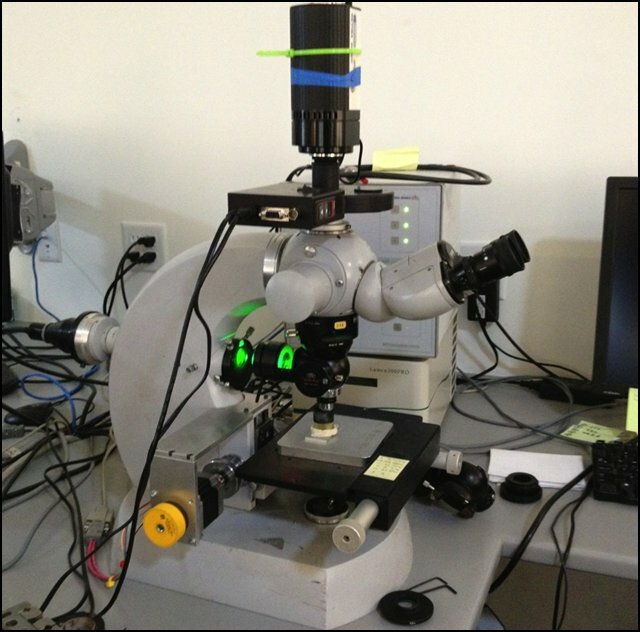 A NIST 2940C relative intensity correction standard for spectrometry is used to calibrate the microscope for fluorescence. Three or more locations are imaged in white, green and blue excitation wavelengths and used to standardize the relative intensity of fluorescence. The coal samples are focused and aligned on the microscope, at this point the software will move to 200 different locations on the pellet in a zig-zag snake formation. This imaging takes place for roughly 40 minutes. During the imaging process the system turns off the light during movement to the next location, to avoid any bubble formation, and disruption of reflectance due to alteration. The light is switched on for focusing in white light. Then filter wheels switch, to Green excitation, and Red Emission, and the sample is imaged again. Another filter switch to Blue light excitation, and Green emission, lastly another reflectance image is taken with standard green emission filter. Then the process begins again for all 200 images. Following imaging, the image sets are processed. Using a series of algorithms both thresholding and segmenting, image calculations are used to remove the binder or resin from all processing. Since most binder and resin tends to fluoresce and have a similar reflectance as Liptinites this can be a difficult task. Figure 1 – Fluoresence Image – Green Excitation (542-nm), Red Emission Filter (650-nm), then the image is false coloured with a red lookup table (LUT) that can emphasize the fluorescing materials. Figure 2 – same image as Figure 1, but in Plain white light (Random Reflectance) oil immersion, field width is approximately 250-um. Vitrinite grain with liptinite banding. 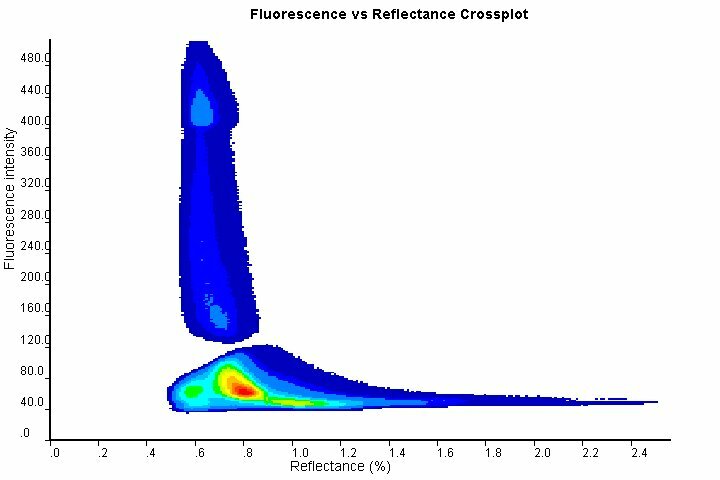 Using the Fluorescence data, a cross-plot that have the fluorescence intensity versus coal random reflectance show a good distinction between the different coal macerals that are fluorescing. Han, Z., Crelling, J.C., Zhou, Y., Fluorescence Intensity and alteration of coal macerals and their relation to coalification, 1993, Organic Geochemistry, p. 667-685. Quick, J.C. 1992, Fluorometric analysis: Relationships with reflectance, weathering, and thermoplastic behaviour, 9th TSOP Meeting, p. 53-55. Rathbone, Robert F., Davis, Alan, The effects of depositional environment on vitrinite fluorescence intensity, 1993, Organic Geochemistry, Vol 20, Issue 2, p. 177-186.